Nintendo’s press conference was by far the most anticipated conference of this year’s E3 because of Project Café. 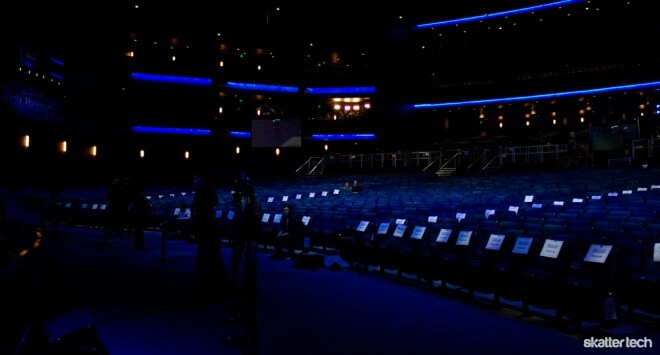 We on the Skatter Tech team were the third, fourth, and fifth people to be seated in the event, and had literally front row seats to the event held at the Nokia Theater in downtown Los Angeles. Here are some of the highlights, including brand new official details about Project Café, now officially named Wii U. This year marked the 25th anniversary of The Legend of Zelda franchise. To celebrate, Nintendo kicked off its press conference with a live orchestra and choir performing the theme song to The Legend of Zelda: Skyward Sword. This was followed by Legend of Zelda creator and Nintendo’s Senior Managing Director Shigeru Miyamoto going on stage and using them as his own personal iTunes, making them perform parts of the Legend of Zelda soundtrack. The real announcements began once the orchestra stopped playing. They started out with the news that in celebration of their 25th anniversary there will be a Legend of Zelda for all Nintendo consoles, with Link’s Awakening being available to download that very day. The Legend of Zelda Ocarina of Time 3D will be released next week on the 3DS, featuring normal and master quest modes as well as a boss challenge mode. In addition, a four player co-op Legend of Zelda Four Swords will be available as a free download. 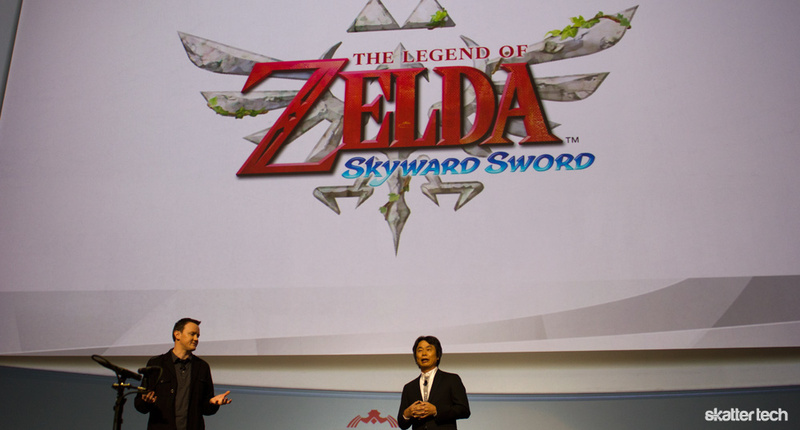 The featured news of the Zelda portion of Nintendo’s press conference, however, was that the highly anticipated new Zelda title The Legend of Zelda Skyward Sword, which officially debuted at last year’s E3 Nintendo conference, would be available on the Wii this holiday season. The game will be coupled with the release of a special new gold Wiimote. They concluded by further discussing the 25th anniversary celebrations for the franchise, including talks of having anniversary symphony concerts around this fall, and the development of both an official Zelda soundtrack CD and an anniversary CD. Finally, it was announced that users who register Ocarina of Time 3D with club Nintendo will receive a free official Zelda soundtrack. After Zelda and a short speech by Global President of Nintendo Satoru Iwata about how Nintendo is striving to “create a platform that is equally satisfying to all gamers” through a new console that would be available next year (i.e. Project Café), the conference shifted gears to Nintendo 3DS, making virtually everyone in the audience groan in disappointment. 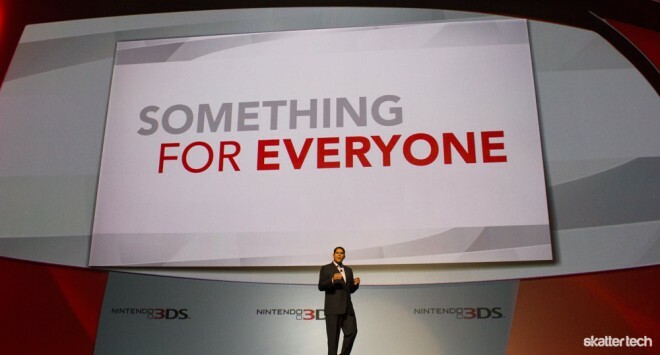 Reggie Fils-Aime, President and CEO of Nintendo America came on stage and started listing some of the new Nintendo games for the 3DS, which include Mario Kart, Star Fox 64 3D, Super Mario, Kid Icarus: Uprising, and Luigi’s Mansion 2. Some new features for these games include the ability in Star Fox 64 3D to see your friends’ faces when playing online, a three on three multiplayer action and augmented reality cards used to conduct battles in Kid Icarus: Uprising, and several new mansions in Luigi’s Mansion 2. They also announced the launch dates for these games, with Mario Kart, Kid Icarus: Uprising, and Super Mario due out during the holidays and Star Fox 64 3D set to launch this September. Luigi’s Mansion 2’s release date wasn’t officially announced, however, since Nintendo assured the audience that all of these titles would be available within the next year it’s safe to assume that it will come out in 2012, likely during the holiday season. A number of third-party developers’ contributions to the 3DS were also announced during the Nintendo press conference. Among them were Mario & Sonic at the London 2012 Olympic Games, Resident Evil: Revelations, Ace Combat 3D, Tetris, Cave Story 3D, Driver Renegade, Tekken 3D, and Metal Gear Solid: Snake Eater 3D. Another major announcement at the Nintendo press conference was that a new Virtual Console service is going to be added to the Nintendo 3DS. Opening up “a new library of games” for the 3DS, the service coupled with the eShop will allow 3DS owners to download classic portable games from both Gameboy and Gameboy Color straight to their handhelds. To tempt consumers, Nintendo revealed that a new Pokedex for Pokemon Black Version and Pokemon White Version would be available exclusively on the eShop (after installing the new system upgrade), which would allow Pokemon fans to start out with 16 Pokemon, explore their world, and find essential codes to truly catch ‘em all. Further sweetening the deal, it was also announced that for a limited time any user who downloads Virtual Console will get a free 3D version of the classic game Excitebike. Finally, a little over midway through the conference, Nintendo spit out the official name for Project Café: Wii U. 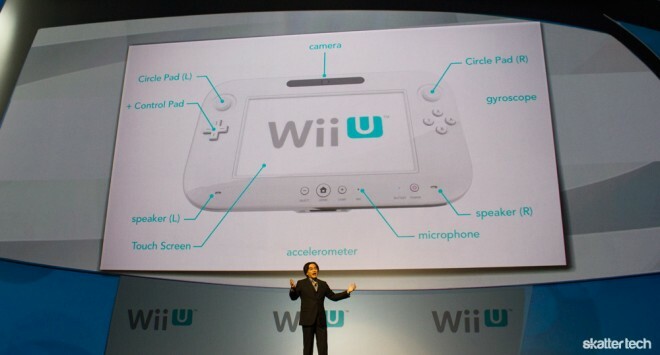 A platform meant to enhance individual players’ Wii experiences (hence the name), Wii U is a console that features a brand new controller that looks a lot like a tablet with buttons. The new Wii U controller has a 6.2 inch touchscreen, two circle pads, a + control pad, gyroscope, L and R bumpers, ZR and ZL buttons, front facing camera, microphone, and left and right speakers. Some of the Wii U features include the ability to switch from Wii to Wii U controllers, being able to draw on the new controller, play only with the controller, use motion to control it, make video calls, send pictures and videos from the controller to the TV, choose between single and dual screen gameplay, et cetera. 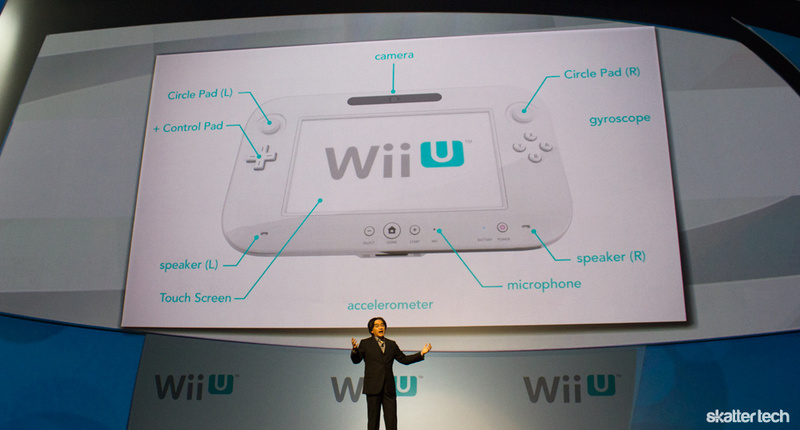 Iwata and Fils-Aime reminded the exuberant audience at the end of the trailer highlighting the Wii U’s components and features that it was not designed to be a portable gaming platform. This statement in and of itself raised just one of many questions we here at Skatter Tech have concerning the Wii U. There has been a lot of confusion since the conference about what exactly the Wii U is: is it a console or is it just a controller? Nintendo calls it a console, but virtually everything in the press conference focused on the features of the new controller. After a fair amount of debate, we’ve concluded that the Wii U is indeed a console and that there’s just heavy focus on the tablet-like controller. With regards to the controller, it is strange that Nintendo included a front facing camera but not a back camera. While a front camera is perfect for video chat, if a user ever wanted to use the Wii U to take a picture or show someone they’re video chatting with something that isn’t directly behind them, he or she will have to physically rotate the controller around. If they had included a back camera, they could simply switch from front to back cameras the way you can with the iPhone 4 and other smartphones featuring front and back cameras. Nintendo also neglected to tell us how many mega pixels the camera is, which makes one wonder just how good the quality will be. Other questions unaddressed in the press conference are how long is the battery life for the Wii U, how far away the controller can be from the TV before it stops working, and what the pricing will be. Considering it looks like the Wii U tablet has many tablet-like features, which would drive the controllers’ pricing up (possibly as high as $200-250 per controller) and make it hard for the average family to afford to buy enough controllers for all family members. Since Wii U won’t be out until after next year, though, hopefully Nintendo will gradually address some of these questions over the upcoming months. All potential issues aside, the Wii U was very well received by the crowd at this year’s E3 Nintendo press conference, particularly when Nintendo started announcing the different gaming titles that are planned for the new console. Nintendo already as Lego: City Stories in development for Wii U, and additional planned games include Darksiders II, Dirt, Batman Arkham City, Aliens: Colonial Marines, Assassin’s Creed, Tom Clancey’s Ghost Recon Online, Tekken, Metro Last Night, and Ninja Gaiden 3: Razor’s Edge. 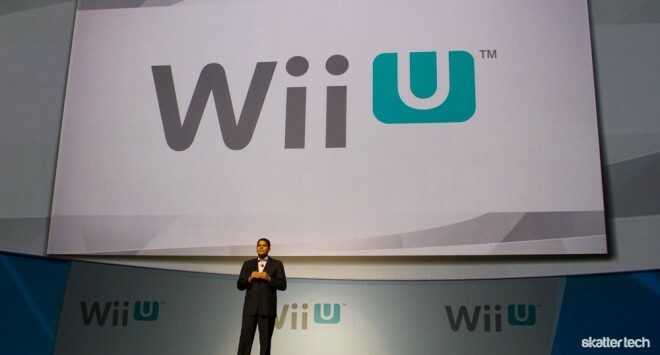 EA has also officially partnered with Nintendo for the first time ever to bring EA games to Wii U. The most exciting announcement, though, was without a doubt the news that a future project Nintendo has its eye on is bringing Smash Brothers to both Wii U and Nintendo 3DS, and that the game will link these two consoles in some way. To quote Skatter Tech reporter Chris Tung, this announcement was like “telling a fat kid that there’s a giant cake in the fridge, but he can’t eat it for the next few months,” and while it’s incredibly frustrating, we will just have to sit tight and wait (as usual) for Nintendo to give us more details about this exciting new project.